*Without* the quotation marks, what does it return? It returns usr/bin/python. The problem is that I can find usr/bin but within that file I can’t find the python binary. What happens if you run this command? 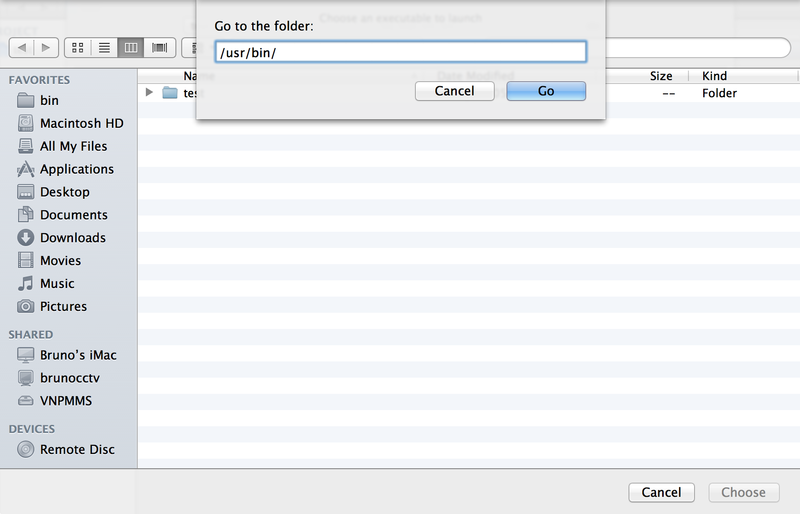 Well great, in that case, it is confirmed that the python binary is in your /usr/bin/ folder. Hmm thanks for the reply 🙂 Is there any way that it could be hidden at all? I have looked in the folder many times but it’s not there to view.. 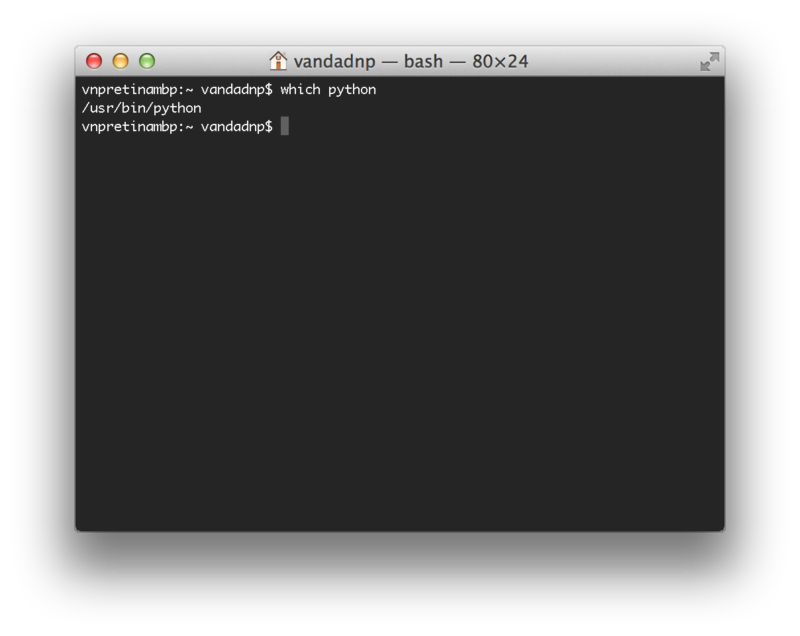 I tried to run a simple program anyway but the error is “can’t exec /usr/bin/python. That’s bizarre. 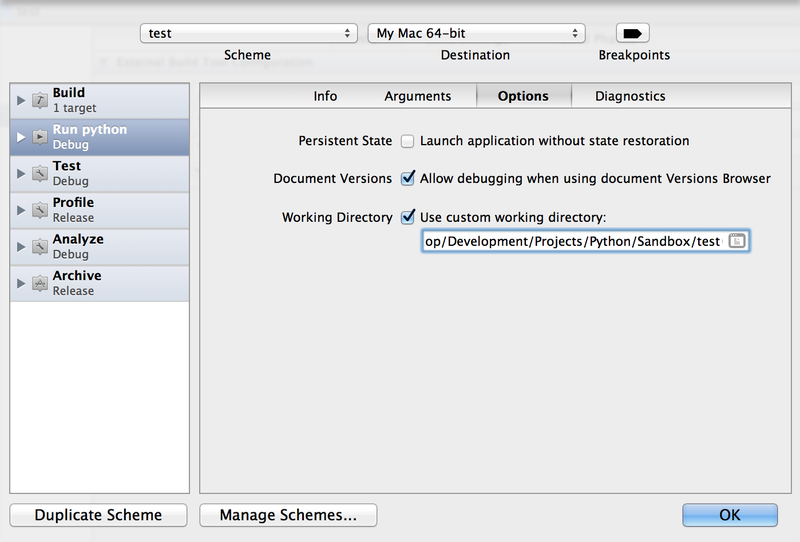 Can you please share your Xcode project with me so that I can try to open it here to find out what the issue is? Is there any way to have a scheme that works with any python script, so I don’t have to create a new scheme every time? Thank you fot the tutorial! 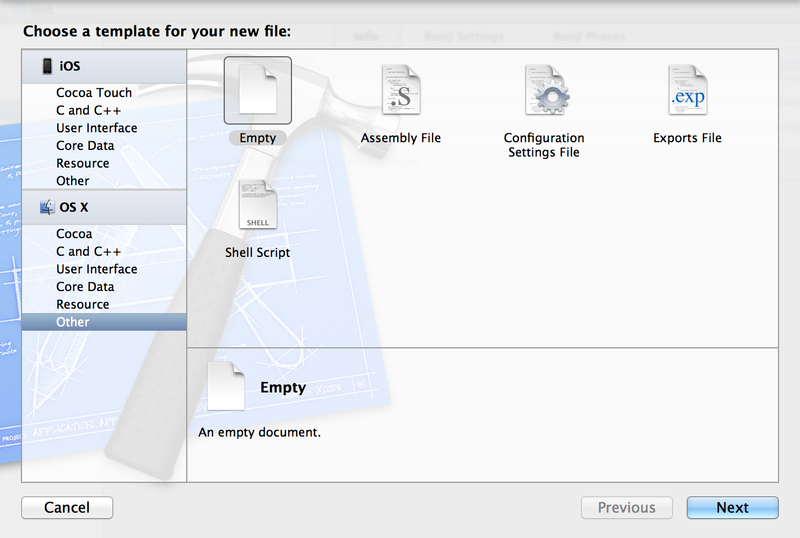 I have a problem with Xcode 4.3. 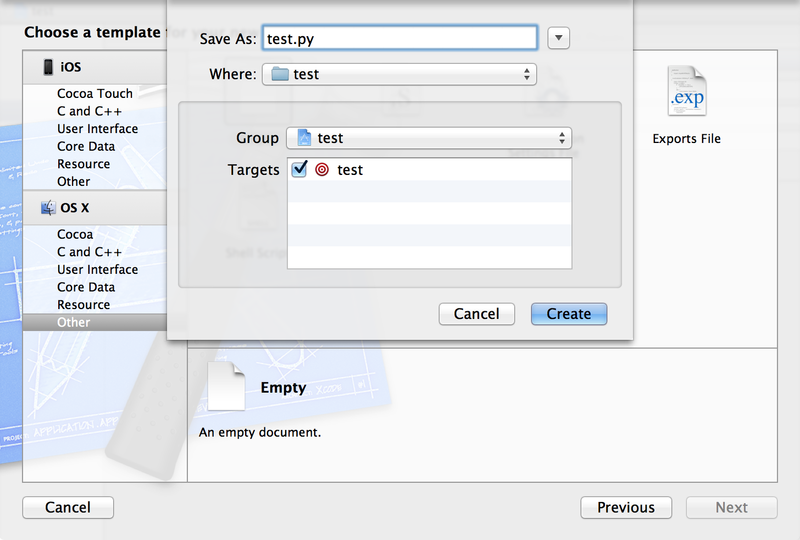 It seems that changing “Working Directory” has no effect and python is searching for “test.py” in the root directory (“/”). My current workaround is to add “full/path/to/test.py” into Arguments. Any ideas why it went wrong? To be more specific, I get this error in the Debugging Area: “/usr/bin/python: can’t open file ‘test.py’: [Errno 2] No such file or directory”. Now to see if some other things work. 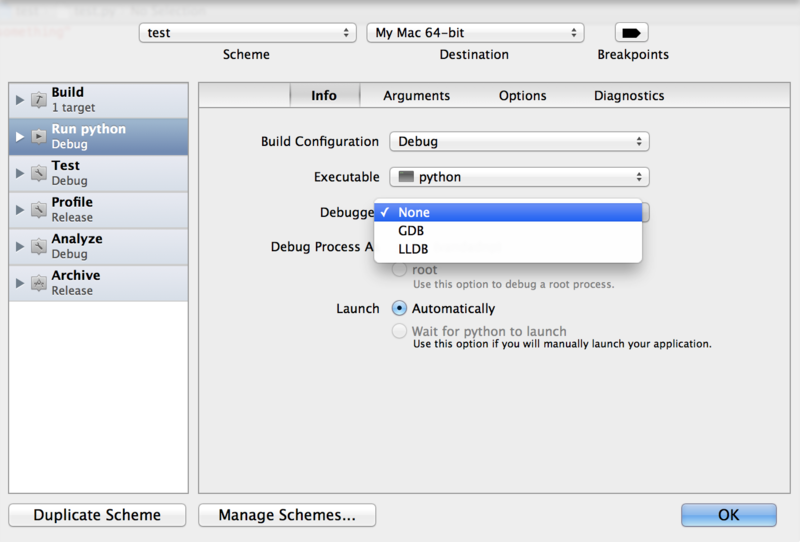 So here is my next question – Just why would I want to use Xcode (instead of Eclipse, for instance)? 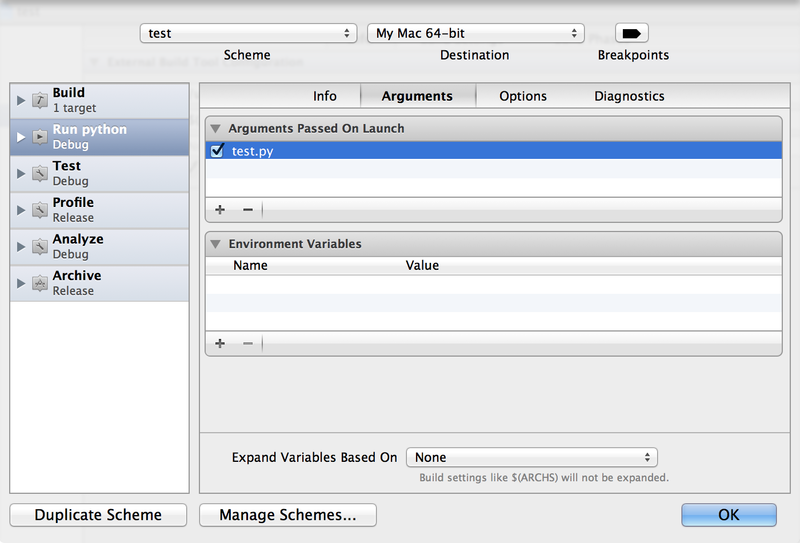 I guess that it has some packaging benefits: on one project I did in eclipse I ran into a problem with @rpath. If I use Xcode will these kinds of issues be resolved? Anyone have experience? Hi Paul. For me, I literally do almost all my development in Xcode, so it’s an IDE that I know my way around. 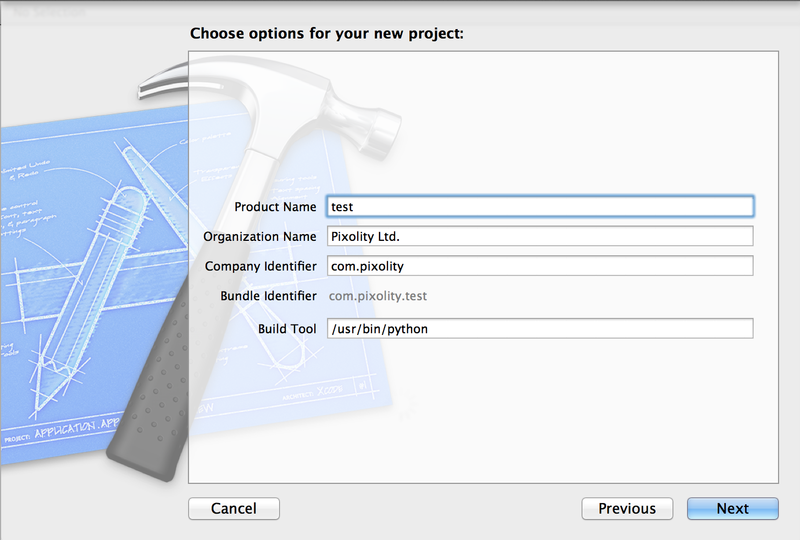 It’s best to use it, at least for me, than to have to learn a new IDE like Eclipse. In my xcode the number line does not appear. Neither does the indent automatically. And when you fail, it does not colored your fail. Only it says the number line which doesn’t appear as I tell you before. 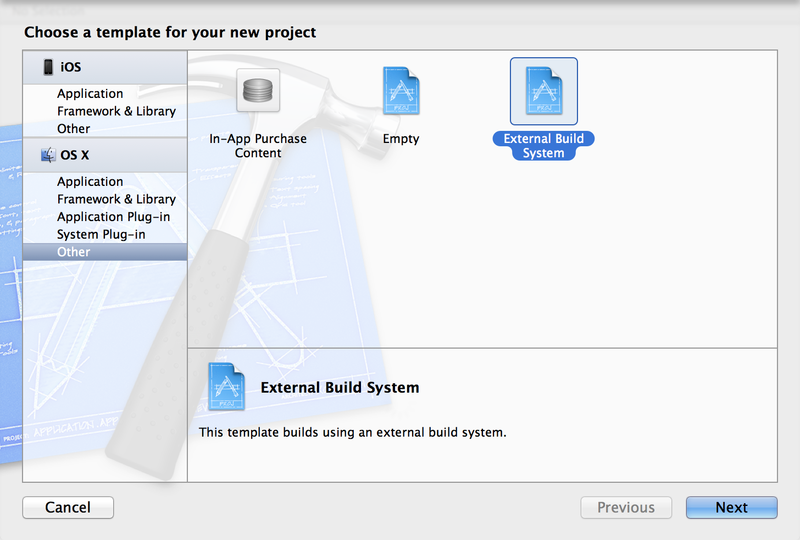 My version of xcode is 4.5.2. Is because of that? How can get this utilities? Hannah, that’s because you have skipped the part where you have to set your Current Working Directory. I am trying to use python 3.3. Other than that, I think it’s a normal system. I finally found my problem. I was trying to use python 3.3. This process works for python 2,.7 but not 3.3. I’m happy with using 2.7 and will pursue 3.3 another day. So how many of these instructions need to be repeated if I want to start a new program? sweet jesus moderate my terrible inputs. Thanks 🙂 I hope you enjoyed it. but will I have to repeat all of these steps just to start a new project in Python? I believe you can simply create a Workspace in Xcode and put your .py files there and do this configuration only once for the whole workspace. When I run a simple test like input a number, I can not input a number. I know I’m missing something but I do not know what it is. Hi, how do I add another python file to the project ? File > New > test2.py runs but prints out test.py’s code. I can’t type input in console..What can i do to make it works? Thanks by the way. It’s awesome.